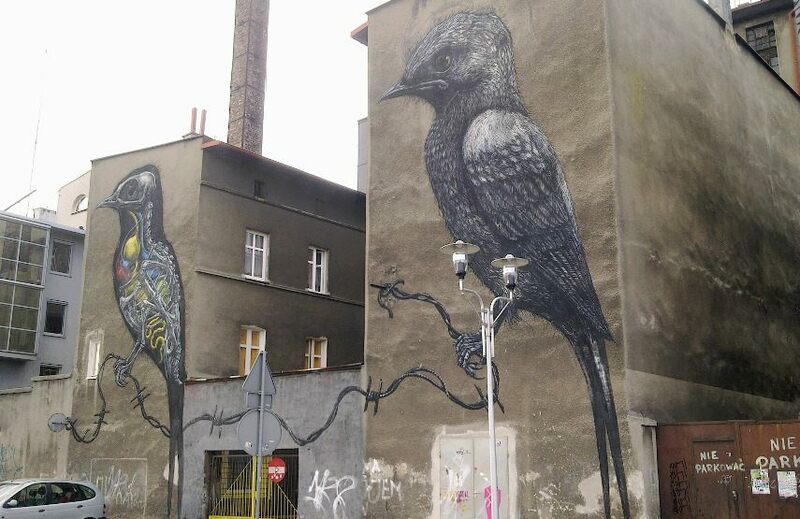 Renowned for his monumental black and white paintings of wildlife, ROA is a pseudonym of a Belgian street artist that has been leaving both accidental and intentional viewers in awe for years now. His hand painted, large scale and unique portrayals of rabbits, birds, rats, fish and other animals disquietly cohabit city streets, whilst his more disturbing images of skeletal or dead creatures directly reflect ROA’s pessimistic opinions of society. Although this street artist’s work is definitely a contender when discussing the most famous and recorded urban pieces in recent history, not much is known about this mysterious painter from Ghent who uses this anonymity to make sure both his artwork and spirit remain uncompromised. As was clued before, not much is known with certainty concerning the private life of ROA. Ever since he was a toddler, this artist remembers wanting to be something adventurous, like an archaeologist who is digging to find answers and collecting long lost bones or artifacts. He grew up in the eighties and the modern American way of life had a strong impact on his young creative expression. The exposure to subcultures of skating and hip hop eventually led ROA to discover the possibilities of graffiti. Intrigued by this most popular form of street art, ROA began as most other fellow street artists did – by spraying tags and throw-ups under bridges and walls of Ghent. During these developmental years, he expressed an active mix of styles, which is pretty logical when you consider Belgium did not have a prevailing urban art movement. 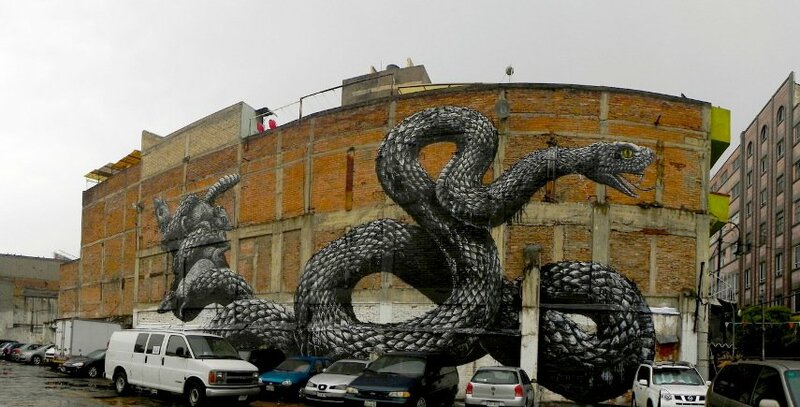 This would, of course, change over time and ROA is to be held responsible for much of stylistic directions this European country took in the sense of street art. Alongside such names as Banksy and Invader, this painter was as well included in the now iconic show Art in the Streets in 2011, a groundbreaking street art exhibition held at the Museum of Contemporary Art in Los Angeles. Truly standing out for his style of paint, imagination and talent, ROA managed to get his work noticed and ever since then his talent has been commissioned by numerous clients. This talented street artist has been painting his pieces all over the world, with his graffiti appearing everywhere from Gambia to Western Australia. ROA’s preferred method of painting is by using spray paint or acrylic paint, applying minimal color pallet of black, white and red – unless he is displaying internal systems within the animals and birds, then he uses a wider range of colors. As was said before, he only paints animals – more precisely, the animals native to the locations where the graffiti is being made. This way the entire piece seems a lot more personal and unique, literally becoming a part of the chosen area on both a physical and conceptual level. The creatures are depicted in their purest forms, regardless from if they are alone or in groups, awake or sleeping , half skeleton or moving about. Carefully using the placement and the enlarging of the graffiti subject, ROA implies the cruelty and absurd relationship of humans and animals, as well as displaying the roots and origins of the depicted beings – this is what’s his art all about. It should also be noted that this painter is deeply preoccupied with the significance of the creative process. Tirelessly working conceptually on each project, ROA nurtures a dynamic energy which evolves during the restricted time frame in which the graffiti must be completed. His method is rather consistent – arriving in a location, he first adapts to his habitat, allowing inspiration to flood from buildings and objects, directing it into the actual graffiti piece. The enormous scale and highly complex nature of ROA’s street art mean that graffiti pieces take many hours to paint. However, most of his pieces are done with permissions, which basically means that his works can be done without pressure and that they usually stick around on the street for a while after he’s done. 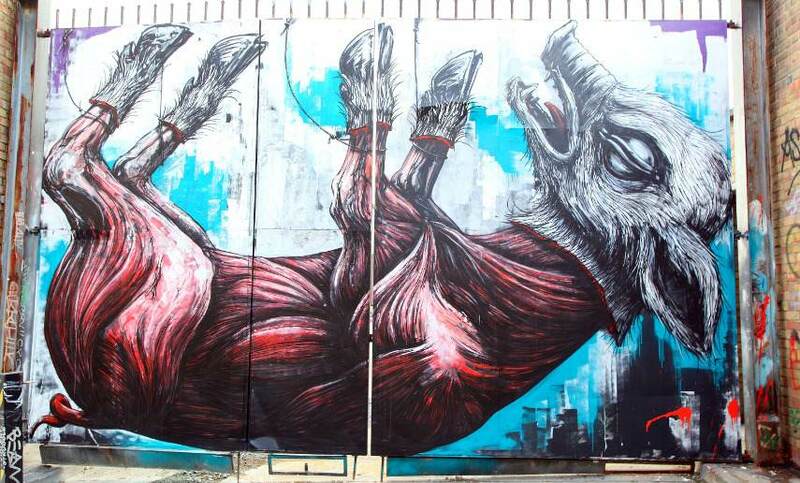 As was said before, ROA’s fantastic murals of animals can be found all around the world, including locations such as London, New York, Berlin, Warsaw, Madrid, Moscow, Los Angeles, Mexico City and Paris. 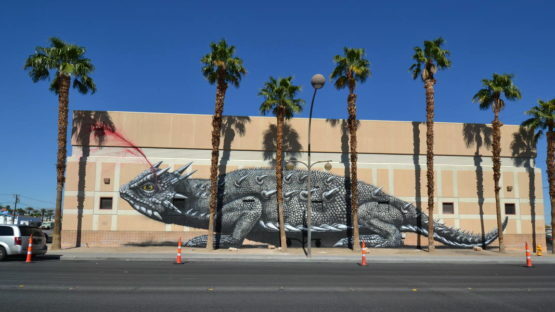 As if his concepts and visuals were not impressive enough, ROA has also produced some of the largest and most recognizable paintings in the relatively short history of street art. And on top of that, his anonymity further helps in establishing the reputation in street art, turning it into something simultaneously glorious and mystical. He once explained why he is so enchanted by the medium with the following: Graffiti is one of the most liberating art expressions of the world – you don’t do it for money nor for an institution, it’s a free expression and it frees you creatively from a lot of restrictions. This is only one of the indications why ROA and graffiti are such a great fit together – but the best one is the actual witnessing of either one of his incredible works. That is the best way to truly admire what may very be one of the greatest street painters ever. The artist is represented by 999CONTEMPORARY and The Garage. ROA lives and works in Ghent, Belgium.